C.H.T Hawkins, until sold; Christie's, London, 13th May 1904 (lot.998) as ‘Unknown, A Divine’, sold for £21 .0 .0 Limner Antiques, 30 November 1974 English Private Collection. Foster, J.J. Samuel Cooper and the English Miniature Painters of the XVIIth Century, Dickinsons, London, 1916, Supplementary Volume, p.78, as ‘Unknown Man (A Divine)’. 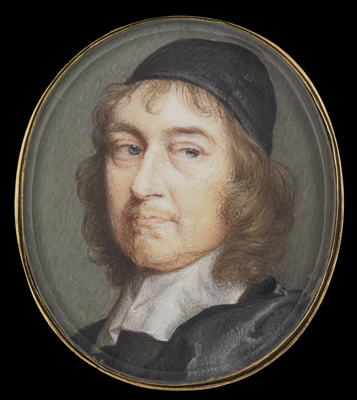 To view seventeenth-century portrait miniatures currently for sale at Philip Mould & Co, please go to www.philipmould.com. The present work, painted c.1655, is a fine example of Cooper’s work during the Interregnum, and would have been painted not long after Cooper was first bestowed the patronage of the Cromwell family. This period was arguably the most important of Cooper’s career and, in terms of portrait miniature painting, one of the most significant in British history. Cooper’s unfinished portrait of Cromwell (Buccleuch Coll. ), painted c.1653, became the prototype for the majority of Cromwell’s best known iconography. Even Sir Peter Lely (1618-80), one of the most important and celebrated portraitists of the seventeenth century, had to make do with copying from Cooper’s portrait when painting his best known work of the Lord Protector in 1654 (Birmingham Museums Trust). Although the identity of the sitter is at present unknown, it can be assumed that he was certainly a man of influence, for to secure a sitting with Cooper at this period would have been difficult to obtain, and, of course, very expensive.